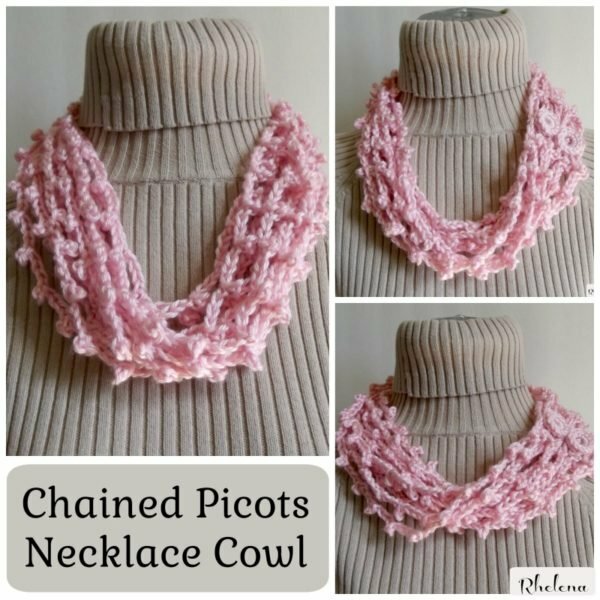 Here is another chained picots necklace cowl. It differs from the previous cowl as it’s joined at each round. It is great for the summer or winter because you decide how full you want it. 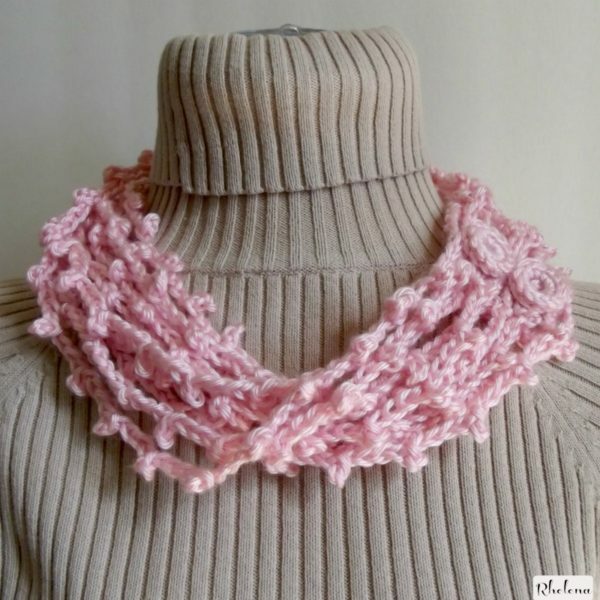 Thus, it can be worn as a necklace cowl or as a cozy winter cowl. 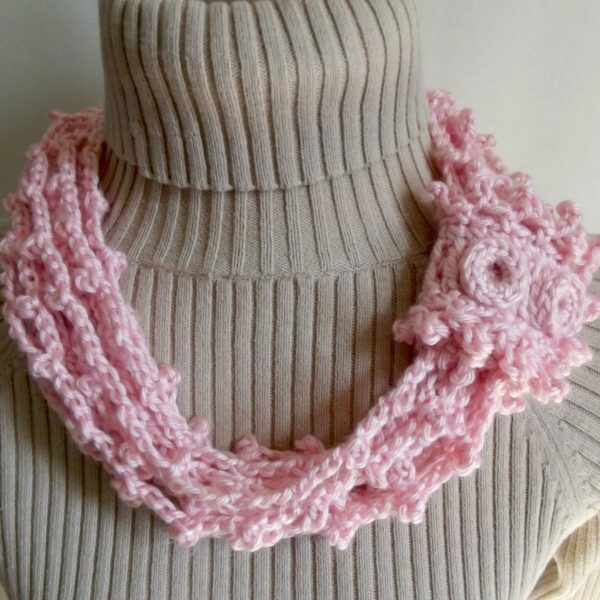 The cowl is shown short with one wrap, but you could easily crochet it longer for a second wrap or wear it down to your waist if you wanted to. It’s basically like one long chain, but each round is joined with a slip stitch in the first single crochet. That way you can wear it with or without the optional wrap to hold it together. The first image below shows the cowl with the wrap worn off to the side. The image below shows the cowl without the optional wrap. It’s just the bone ring buttons attached to the single crochet seam. This is actually my preferred way of wearing it… but…. Wear the buttons at the side. You can also hide the buttons at the back for a nice full look at the front. It’s great if you have long hair, or if you plan on wearing it under a coat. Hide the Buttons at the Back. Yarn: Loops & Threads Soft & Shiny, or any worsted (4) yarn. Two 1/2″ Bone Rings or two 1″ buttons. Finished Size: Laying flat it measures about 13″ wide. Can be increased to any length by doing more repeats in each round. Fullness can be increased by doing more rounds. Rnd 1: Ch 1, sc evenly around working 3 sc in each corner, and making sure to end with an even number of sts in the round. Rnd 2: Ch 1, (sc, ch 4, sl st in 3rd ch from hk, ch 1) in first st, skip next st, *(sc, ch 4, sl st in 3rd ch from hk, ch 1) in next st, skip next st repeat from * around; join with sl st in first sc. Here is the Pattern for the Bone Ring Buttons. Sew the buttons onto the single crochets after the third row on each edge. Use the Tr’s on the wrapper as button holes and wrap it over the buttons as shown. If you’d like a printable PDF, you can use the print friendly button below, or buy the ad-free version for only a buck on Ravelry or Craftsy. Thank you to Helen Haberern for testing this out for me. 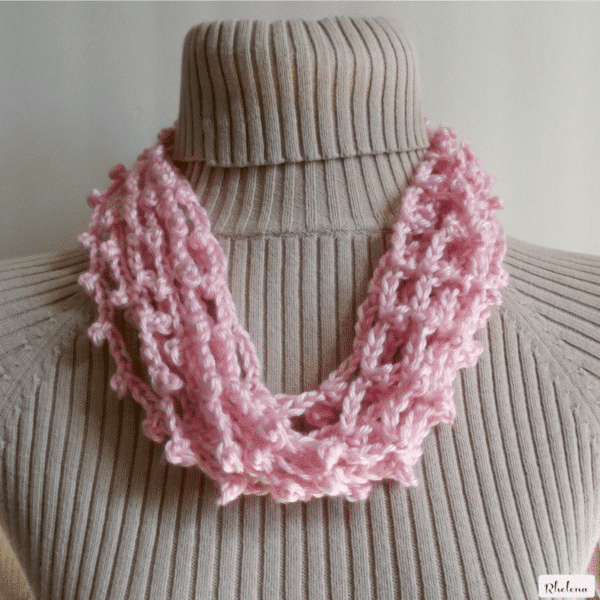 And if you like, please visit CPB for a nice collection FREE Cowl & Infinity Scarf Patterns.